I would like to start my report by thanking the Trust for awarding me a scholarship which went towards my university fees. I was extremely privileged to have been chosen and cannot express how much it has helped towards my studies. The course is split into two years of study. My first year has been challenging yet very rewarding. 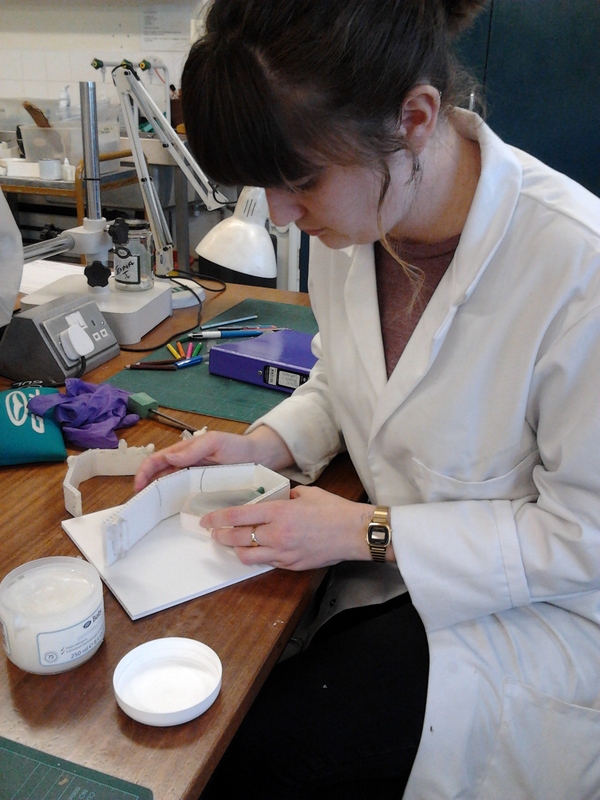 One core module is in the lab where we get hands on experience working with objects when all treatment plans are researched fully by the students and then run by the lecturers before work begins. I found this module very rewarding and really enjoyed working on the objects I was assigned. When I began the course I was concerned that my lack of chemistry knowledge would be an issue. However I have been pleasantly surprised by how much I have picked up along the way. This year I have learned about moulding and casting and produced a replica of an arrow head, using epoxy resin. I also worked on a turn of the 20th century photographic printing blocks belonging to a church and whose ministers feature in the images. Researching these blocks and their history has been incredibly interesting … and I hope that they will act as a record of church life for another 100 years. A further project was cleaning and stabilising leather, which probably came from different medieval shoes. The objects belong to a local museum so one of my goals was to make them easy to understand visually and to prepare a support for their display. This summer I am fortunate to be spending an eight week placement with the team working on the Mary Rose at Portsmouth, which will be a valuable experience and prepare me both for the second year of my studies and for finding future employment within the industry.